Big Five personality tests are used to understand the relationship between personality and behavior as part of the hiring process. Prepare for some of the most common Big Five tests: 16PF test, NEO, Caliper Personality Inventory (CPI), Big Five Inventory. Take a practice Big Five Personality test, access personalized reports & study guides. Start preparing for your CPI personality test today. JobTestPrep offers a Personality Test PrepPack™ to prepare you for any type of personality test. Our pack includes a practice test, answer explanations, and a detailed score report. It also includes study guides to help you gain a better understanding of the different personality traits. 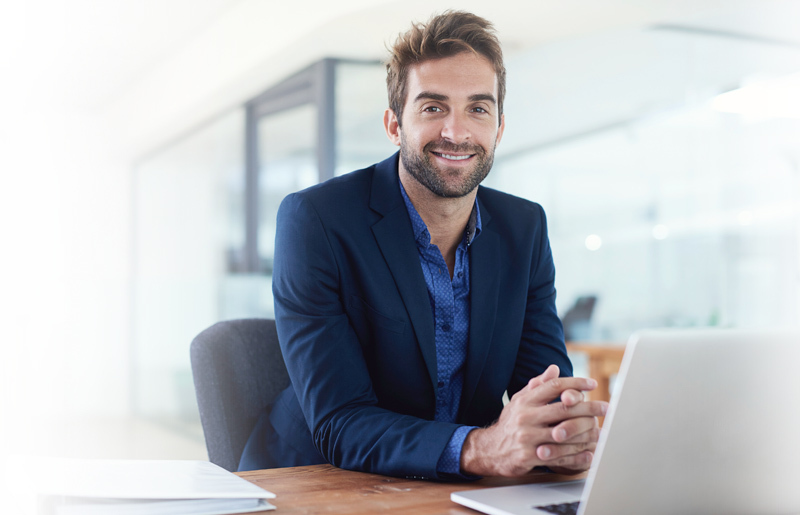 One of the study guides is a professional study guide with which you can compare your results to traits that are desired for a specific profession. In addition, we offer "Single Trait Practice" to optimize your answers for the specific job you seek. Start practicing with our PrepPack™ today to ensure you succeed on the test. What Is the Big Five Model? The Big Five model is comprised of five basic dimensions of personality, often referred to as the "Big 5" personality traits. These five personality traits are extroversion, agreeableness, openness, conscientiousness, and neuroticism. Big Five personality tests use the Big Five model, also referred to as the five-factor model (FFM). Psychologists use these five personality traits to define a person's personality type. There are multiple personality tests that have modeled their tests after the Big Five model. Who Uses Big Five Personality Tests? Many companies use personality tests during their hiring processes. The purpose of personality tests is to compare an applicant's traits against traits required by the position to which he or she is applying. Employers may also use personality tests to evaluate their employees or change group dynamics. Below is a list of personality tests that use the five-factor model. 16PF – The 16PF contains 185 items and has a 30–50 minute time frame. Assess – This test has 350 questions and highlights your strengths and weaknesses. Big Five Inventory (BFI) – The Big Five Inventory contains only 44 items and takes about five minutes to complete. There is also a shorter version that contains 11 items. Caliper – This is a multiple-choice exam with 180 questions and no time limit. CPI – There are two types of CPI assessments, CPI 434 and CPI 260. The CPI 434 contains 434 items, whereas the CPI 260 contains 260 items selected from the full 434-item assessment. cut-e shapes – There are different kinds of shapes, each containing 6–8 items. This test takes between 10–20 minutes to complete. HEXACO – There are three different HEXACO tests. Each has a different length of either 200 items, 100 items, or 60 items. Hogan HDS – This test takes about 15–20 minutes to complete and assesses characteristics that are likely to arise during times of stress. Hogan HPI – This takes approximately 15-20 minutes to complete and measures your normal/bright-side personality. Inwald – The Inwald personality test is comprised of 310 true/false questions. IPIP – The IPIP contains 300 items and takes 30–40 minutes to complete. MMPI – The MMPI contains 567 true/false questions. The test is untimed, but it can take between 60 and 90 minutes to complete. NEO Personality Inventory – The NEO-PI-R contains 240 items and has a 35–45 minute timeframe. Newcastle Personality Assessor – This personality test measures five dimensions and contains 10 questions. OPQ – The OPQ-32 is comprised of a maximum of 104 questions. PSV20 – The PSV20 contains a total of 90 items. Sigma – Sigma personality tests contain between 150–300 items and take between 20–45 minutes to complete. Sosie – This test contains 80 multiple-choice items and is untimed. However, it takes approximately 25 minutes to complete. Talent Q Dimensions – This questionnaire can take up to 25 minutes to complete. Winslow – The Winslow personality test contains 300 questions and takes one hour to complete. Wonderlic – Wonderlic offers three different personality tests consisting of between 88–150 questions. Depending on the test, it can take between 15–30 minutes to complete. What Are the Big Five Personality Traits? The big five traits are referred to as "OCEAN"—Openness to Experience, Conscientiousness, Extraversion/Introversion, Agreeableness, and Neuroticism. This refers to a person likely to show an appreciation for art, emotion, adventure, unusual ideas, intellectual curiosity, creativity, and variety of experience. A person may also show traits of imagination or independence. Additionally, this trait depicts a personal preference for a variety of activities over a strict routine. High Score – High scorers can be perceived as unpredictable or having a lack of focus. In addition, a person with a high score in openness is more likely to engage in activities like skydiving, living abroad, or gambling. Low Score – Low scorers tend to gain fulfillment through perseverance, and they are characterized as pragmatic and data-driven. Sometimes they are perceived to be closed-minded. I am quick to understand things. I am full of ideas. This refers to a tendency to be organized and dependable, show self-discipline, act dutifully, aim for achievement, and prefer planned rather than spontaneous behavior. High Score – High scorers are often perceived as stubborn and obsessive. Low Score – Low scorers display flexibility and spontaneity, but they can be perceived as sloppy and unreliable. This trait reflects energy, positive emotions, assertiveness, sociability and the tendency to seek stimulation in the company of others, and talkativeness. Introverts have lower social engagement and energy levels than extroverts. They tend to appear quiet, low-key, deliberate, and less involved in the social world. Introverts need less stimulation than extroverts and more time alone. High Score – High scorers are often perceived as attention-seeking and domineering. Low Score – Low scorers display a reserved, reflective personality, which can be perceived as aloof or self-absorbed. I don't mind being the center of attention. I feel comfortable around people. This reflects a tendency to be compassionate and cooperative rather than suspicious and antagonistic toward others. It is also a measure of one's trusting and helpful nature, and whether a person is generally well-tempered or not. High Score – High scorers are often seen as naive or submissive. Low Score – Low scorers are often competitive or challenging people, which can be viewed as argumentative or untrustworthy. I sympathize with others' feelings. I take time out for others. I make people feel at ease. This refers to a tendency to experience unpleasant emotions easily, such as anger, anxiety, depression, and vulnerability. It also refers to the degree of emotional stability and impulse control, which is why it is sometimes referred to by its low pole, "emotional stability." High Score – High scorers display a need for stability and a calm personality, but they can be seen as uninspiring and unconcerned. Low Score – Low scorers display a need for stability, which causes a reactive and excitable personality. These people are often seen as very dynamic individuals, but they can be perceived as unstable or insecure. I get stressed out easily. People who don't show any specific characteristics from the Big Five are considered adaptable, moderate, and reasonable personalities, but they can also be perceived as unprincipled, inscrutable, and calculating. 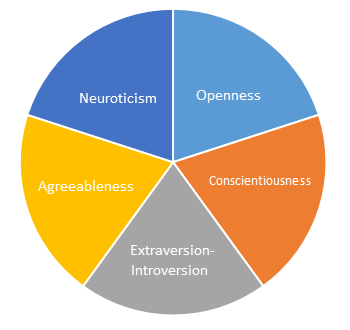 Each of the Big Five personality traits contains two separate, but correlated, aspects reflecting a level of personality. The aspects are labeled as follows: Volatility and Withdrawal for Neuroticism; Enthusiasm and Assertiveness for Extroversion; Intellect and Openness for Openness/Intellect; Industriousness and Orderliness for Conscientiousness; and Compassion and Politeness for Agreeableness. You can work on each trait independently at your own pace and as you see fit. You can practice each trait to understand its nature and optimize your answer accordingly on the real test. You can save precious time by practicing only the trait for which you need to optimize your answer. You can use our professional guide to receive the full answer breakdown for each one of the traits. You can optimize the way you present yourself on every aspect of your personality profile. We offer free sample personality questions to prepare you for any Big Five personality test. Start practicing now.